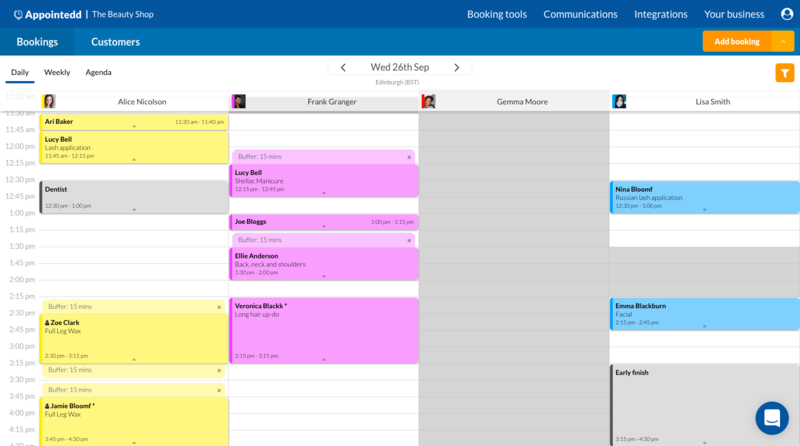 Allow customers to book in their favourite service at the click of a button and manage multiple stylist's calendars from one desktop. Factor in treatment rooms, different working hours, and connect external calendars so staff can view their appointments with ease from their own devices. We recommend embedding our easy to use booking apps straight onto your website. Embed or create a Book Now button and popover. You can have more than one booking app, so change them up. Restrict them to only show certain service groups or only your head therapist's services. Allow resource selection so clients can choose their regular beautician, and their accordingly priced service for their level. Explore these to set notice and cancellation policy and so much more. Booking questions should be set up to get the information you need for the booking so you can prepare. Example: have you done a patch test? or what colour of shellac would you like? or accept T&Cs etc. Set up your confirmations, reminders and follow-ups to send to your customers by email and SMS text message. These can include all of the information about our business and you can even customise the content of reminders and follow-ups according to the service/staff member booked! Check out this guide to setting up confirmations and this guide to setting up reminders and follow-ups. Set up a resource for each of your beauticians/therapists so they each have their own calendar. Turn on each resource's notifications so they are alerted when a new client books in with them. Set their individual working hours and manage their days off. Group your resources into beauticians, nail technicians etc. Create your services and categorise them into hair, nails etc. Assign a price and payment option (deposit, full, skip) on a per service basis. POA is useful if you decide on price after taking the booking, once you know what materials you'll need. Send a payment request to take online payment at a later date. Use buffers for prep and clean up time. Assign each service to a beautician that can carry out the service. You don't want to book two manicures at one time if you only have one nail station! Ensure equipment and rooms are accounted for through assets. Set your user permissions so each therapist has their own login and their own access levels. Additionally, if a therapist leaves you, you simply delete the user so their login details no longer give them access to your account. Check out how Castlefield Beauty Bar use Appointedd to see how it could make a difference in your business. You can also read our health & beauty business page here.